We have a right to expect that our laws are based on logic and we have a right to expect that our laws create more good than harm. The federal marijuana prohibition FAILS on both these counts. Banning adult marijuana sales makes children LESS safe! We have allowed the federal government to experiment with this policy of prohibition for more than FORTY years and it has NEVER worked! Instead of protecting children from marijuana, the prohibition makes marijuana MORE accessible to children by creating large profits for drug dealers where otherwise there would be NONE. Just look at how hard it is to buy illegal alcohol and how easy it is to buy illegal marijuana and you see firsthand the effectiveness of alcohol legalization and the ineffectiveness of marijuana prohibition! WE are responsible for the safety of our children and WE have to insist that the federal government ENDS the ineffective marijuana prohibition and instead regulates and taxes marijuana just as it currently does with beer and wine. Colombia, Peru, Mexico or Afghanistan with their coca leaves, marijuana buds or poppy sap are not igniting temptation in the minds of our weak, innocent citizens. These countries are duly responding to the enormous demand that comes from within our own borders. Invading or destroying these countries thus creating more hate, violence, instability, injustice and corruption, will not fix our problem. We need to collectively admit that we are sick. -- Prohibition is neither a sane nor a safe approach; left unabated, its puritanical flames will surely engulf every last one of us! The illegal drug trade is now estimated to be somewhere in the region of $400 billion a year ( equal to the defense budget ). This "former land of the free" arrests 1.5 million of it's citizens a year for drug law violations, half for marijuana alone, The majority of the 2.2 million inmates in the USA are incarcerated because of this insane drug war (Prohibition 2) at a staggering cost to all taxpayers and trauma to their families. Prisons have been filled to capacity. Violent criminals, murderers, rapists and child molesters are released early to create space for these so called drug offenders. Half of court trial time and also a huge chunk of police officers time is pointlessly wasted. Enormous untaxed profits from illegal drugs fund multi-national criminal empires which bribe law enforcement authorities and spread corruption faster than a raging bush fire. These laws take violent criminals and turn them into multi-billionaires whilst corrupting even entire countries such as Columbia, Panama, Mexico and Afghanistan. 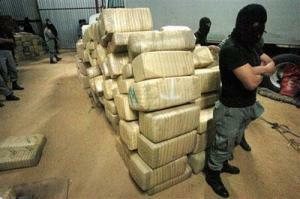 The extreme violence on and south of the border is drug gangs fighting for turf in this lucrative business. The drug laws are also funding the Taliban whose illegal opium profits allow it to buy weapons and pay it's fighters more than $300 a month, compared with the $14 paid to an Afghan policemen. When governments prohibit drugs they effectively and knowingly hand a monopoly on their sale to dangerous criminals and terrorists. Without a legal framework in which to operate, these black-market entities can always be expected to settle their disputes violently while terrorizing many peaceful and innocent citizens in the process. Were the users of alcohol to blame for the St Valentines massacre in the US in 1929? Of course not! It is just as naive to assume that one can compel all the users of Marijuana or Cocaine to simply quit, as it is to assume that all the users of Alcohol should have stopped drinking after the introduction of alcohol prohibition in 1919. Nobody can be expected to obey bad laws, like ones that infringe on logic as well as the fundamental right to decide on what medicine or poison an individual adult may, or may not, ingest. The corruption, violence and death ultimately arising from such bad public policy should always rest squarely on the shoulders of those ignorant imbeciles who are responsible for implementing and supporting such foolishness. First of all it's treason, second, there's no amendment. Third, a "crime" has to have a victim, and/or, an injured party to be compensated for such injury. Forth, using public funds (tax dollars) to print and distribute deliberately false and misleading information is a crime, mis-scheduling pot as a schedule 1 drug to enhance criminal penalties is just childish. Our government breaks more laws, kills more people, ruins more families, wastes more money, jails more people, causes more harm, and lies, trying to enforce a misguided policy, that they have no power to make in the first place, and is unconstitutional, than the drugs. Meanwhile, the ones that push the real harmful drugs, are advertising on TV.